The snow has finally begun to accumulate in earnest above 4000 feet over the last week or so in the Pacific Northwest. This weekend's unusual storm track features a fine line between rain and snow, and the North Cascades both west and east of the crest and the Olympic mountains are the main snowfall winners. There's also been a net snowdepth gain on the upper elevations of the volcanoes, but generally above NWAC's forecast ceiling of 7000-8000 feet. Wet snow and plain old rain has been the story for much of Friday and Saturday for the central/south Cascades and Mt. Hood, so there isn't much of a snowpack to discuss in those areas. A net gain of snowdepth today just above Heather Meadows at Mt. Baker and just above Washington Pass with a 2-2.5 ft base at the two NWAC stations. Hart's Pass NRCS Snotel is around 40 inches. Hurricane Ridge access is closed according to the NPS website but they also have established a base. Unfortunately our weather station is down; we are waiting for the NPS to provide a new means of communications for our site. Significant snow will continue to accumulate near and above treeline especially in the North Cascades, east and west of the divide through Sunday morning. This is also the case for the Olympics. Sunday will be much cooler with lowering snow levels. Snow showers on Sunday are expected to taper down during the day with generally light additional accumulations expected. Generally small storm and wind slab avalanche problems are most likely to be found in the North Cascades in the near and above treeline elevation bands and are potentially more sensitive for the first half of the day. North through Southeast aspects are the mostly likely aspects to be wind-loaded. 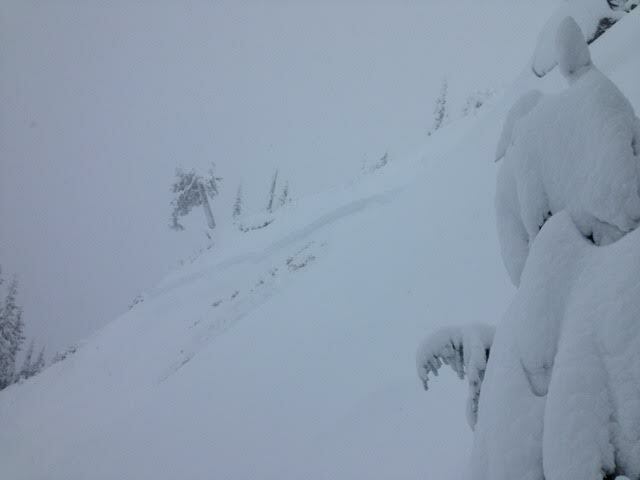 Ski areas are closed and avalanche control work has not been performed! You are responsible for slope evaluation whether you are inside or outside a ski area. Expect more advanced avalanche problems higher up on the volcanos; there were 2 climbers caught in a small avalanche near Illumination Rock on Mt. Hood just last week. Terrain anchors should limit lower elevation avalanche concerns but conversely increase the chance of you hitting a newly hidden rock or tree stump. Ride with care! Still reading? You might be wondering when NWAC will begin daily mountain weather and avalanche forecasts. An incoming storm on Monday should start as snow but then transition to warm and wet weather for Tuesday. We will re-evaluate after Tuesday's storm system, but our best guess at this point is that we may still be a week or more out from daily forecasts.